Carl Theodor Dreyer, Jr. (February 3, 1889 - March 20, 1968) was a Danish film director who is regarded as one of the greatest directors in cinema. Although his career spanned the 1910s through the 1960s, his meticulousness, tyrannical-dictatorial methods, idiosyncratic shooting style, stubborn devotion to his art, and difficulty raising money to finance his film projects ensured that his output remained low. In spite of all that, he produced some of the most enduring classics of international cinema. His best known film, The Passion of Joan of Arc, was listed in fourteenth place in the 2002 poll taken every decade by international critics with the British Film Institute's highly influential journal Sight and Sound. Dreyer was born illegitimate in Copenhagen, Denmark. His birth mother was an unmarried Swedish maid named Josefine Bernhardine Nilsson, and he was put up for adoption by his probable birth father, Jens Christian Torp, a farmer who was his mother's employer. He spent the first two years of his life in several different foster homes until his adoption by a typographer named Carl Theodor Dreyer, Sr., and his wife, Inger Marie. Tragically, before the private adoption could be finalized, the boy's mother, Nilsson, while carrying another child out of wedlock, took an accidentally fatal dose of phosphorous in an attempt to induce a miscarriage. Just when the young Dreyer learned the circumstances of his birth and of his mother's fate is not known, but he seems to have suffered in deeply wounded silence about these facts for much of the rest of his life and to have been especially sensitive to the plight of abused and downtrodden women. Dreyer's adoptive parents were strict Lutherans and his childhood was largely unhappy, but their teachings and discipline were to influence the themes of his films. He was an academically gifted student, but at the age of sixteen he left home, discontinued his formal education, and disassociated from his adoptive family. He then took up a series of unsatisfying office jobs before finding himself as a journalist. He worked as a reporter for several newspapers including Berlingske Tindende and Politiken. At the age of 21, he joined a group of young reporters in starting a short-lived newspaper called Riget. He also became part of the young aviation society, and his articles about this brought him to the attention of the Nordisk Film Company, for which he served as a technical advisor about hot air balloons. He then worked for awhile on the journal Ekstra Bladet, and also had increasing connections with the young Danish film industry, which got him some occasional jobs at writing titles and film scripts. Then in 1913 he signed an exclusive contract with the studio Nordisk. In the next several years his interests broadened to include film editing (he was good at it) and eventually to directing. Dreyer's first film as director was a melodrama entitled The President (1918). Instead of studio actors employed by Nordisk, Dreyer assembled a cast of professional and non-professional actors selected for their appropriate face types. He dispensed with cosmetics and decorated sets so he could achieve a naturalness and realism to his films. The President deals with something that was personal for Dreyer: a parent’s moral responsibility for a child conceived out of wedlock. As Acquarello puts it in the Senses of Cinema account of Dreyer, "In the film, a prominent and well respected judge (Halvard Hoff) is forced to decide the fate of his adult illegitimate daughter, a governess named Victorine (Olga Raphael-Linden) when she is brought before the court to face charges for the death of her newborn child. Ironically (and perhaps, uncoincidentally), Victorine’s circumstances—a good woman seduced by her unethical and irresponsible employer—provides a intriguing plausible theory to Dreyer’s paternity." In 1920, Dreyer made Prästänkan, known in English as The Parson's Widow. Here a young man, a divinity student and theologian, works to receive his first parsonage, which he does by undercutting the other applicants. But he then finds that a condition of his appointment as parson is that he must take care of the widow of the late parson, a dour and harsh woman who has already outlived three husbands. He eventually marries her, and also brings his young fiancée into the parsonage under the pretext that she is his sister. The film is part comedy, part commentary on male-female relations, part domestic satire, and part commentary on aging, obsolescence, and the social status of women, especially elderly ones. In 1921, Dreyer made Blade af Satans Bog, also known as Leaves from Satan's Book. This deals with the Story of Satan's banishment from heaven and his being doomed to tempt humans. It presents world history through showing how human experience is a reaction to and a consequence of divine providence. Motion picture poster for "The Passion of Joan of Arc" directed by Carl Theodor Dreyer, with Renée Jeanne Falconetti (pictured) and Antonin Artaud, produced in France in 1927 and first shown in Copenhagen in 1928. In 1928 Dreyer's great classic film and the one for which he is best known appeared, The Passion of Joan of Arc. Working from the transcripts of Joan's trial, he created a masterpiece of emotion that drew equally from realism and expressionism. The film is silent. It is a study of faces—the inquisitors and priests who question and attempt to trick her and who ultimately condemn her, and Joan, stoically standing against them. The film is made in a series of stunning shots, many of them at odd angles. The effect is to show the inner soul of both the inquisitors and Joan, up to the time of her confession, and then her recantation of that confession, which leads to her death sentence and her being burned at the stake. Critic Roger Ebert has written about this film, "You cannot know the history of silent film unless you know the face of Renee Maria Falconetti [the actress who played Joan]. In a medium without words, where the filmmakers believed that the camera captured the essence of characters through their faces, to see Falconetti in Dreyer's The Passion of Joan of Arc (1928) is to look into eyes that will never leave you." Later he says, "you will never see the whole set in the movie. There is not one single establishing shot in all of The Passion of Joan of Arc, which is filmed entirely in closeups and medium shots, creating fearful intimacy between Joan and her tormentors." He concludes his essay on this film, "Perhaps the secret of Dreyer's success is that he asked himself, 'What is this story really about?' And after he answered that question he made a movie about absolutely nothing else." Dreyer used private finance from Baron Nicolas de Gunzburg to make his next film as the Danish film industry was in financial ruin. Vampyr (1932) is a surreal meditation on fear. Logic gave way to mood and atmosphere in this story of a man protecting two sisters from a vampire. The movie contains many indelible images, such as the hero, played by de Gunzburg (under the screen name Julian West), dreaming of his own burial and the animal blood lust on the face of one of the sisters as she suffers under the vampire's spell. The film was shot as a silent film but had dubbed dialogue added later. Both films were box office failures. Dreyer did not make another movie until 1943. Denmark was by now under Nazi occupation and his Day of Wrath had as its theme the hypocrisy of people who engaged in witch hunts. With this work, Dreyer established the style that would mark his sound films: careful compositions, stark monochrome cinematography, and very long takes. One shot in Day of Wrath is more than 20 minutes. In the more than a decade before his next full-length feature film, Dreyer made two documentaries. In 1955, he shot Ordet (The Word) based on the play of the same name by Kaj Munk. The film combines a Romeo and Juliet-style love story with an examination of faith. The film uses long panning shots and a spare and precise composition. In the end, the words of Johannes, a seeming madman, provides the word that saves his family from pain and misery. Dreyer's last film was 1964's Gertrud. This was a fitting close to Dreyer's career as it deals with a woman who, through the tribulations of her life, never expresses regret for her choices. She is a privileged woman, married to a professional man, who is unhappy with her life and marriage. She takes a young pianist as her lover, but it is soon clear that he too is insincere in his love and is using her for his purposes. She eventually falls ill and is visited by a former lover, who expresses a great love for her, but she spurns him, saying, "A woman's love and a man's work are mortal enemies." Although the lover implores her, she refuses to reconsider her decision. This film uses long takes and static shots, a minimalist and austere style that reflects Gertrud's own inner attitude. The great, never finished project of Dreyer’s career was a film about Jesus. Though a manuscript was written (published 1968) the unstable economic conditions and Dreyer’s own demands of realism, along with his moving from one producer to another, let it remain a dream. In return a manuscript by Dreyer about Medea (1965) was realized by Lars von Trier in 1988. "Dreyer's pared-down style takes him beyond surface realism to something more mysterious and abstract: sounds or shadows (as in the truly eerie Vampyr) evoke the presence of unseen beings, landscape and architecture are invested, by lighting, design and composition, with supernatural force. Paradoxically, by rejecting anything superfluous to his purposes, this undisputed master of the cinema created some of its richest, most affecting and wondrously beautiful studies of the human condition" (Geoff Andrew, The Director's Vision, 1999). "Dreyer's work is always based on the beauty of the image, which in turn is a record of the luminous conviction and independence of human beings. His films are devoted principally to human emotions, and if they seem relatively subdued, then that may be a proper reason for calling in Danishness. But simplicity and purity of style do not argue against intensity, Dreyer's greatness is in the way that he makes a tranquil picture of overwhelming feelings. His art, and his intelligence, make passion orderly without ever cheating on it" (David Thomson, The New Biographical Dictionary of Film, 2002). Carl Theodor Dreyer is indisputably one of the greatest film directors—auteurs to use the highly influential term introduced into film study and criticism by the writers of the French film journal Cahiers du cinema, especially by François Truffaut—in the history of the film medium. His output was relatively small, but at least five of his films—The Passion of Joan of Arc (1928), Vampyr (1932), Day of Wrath (1943), Ordet (1955), and Gertrud (1964)—are among the best films in the history of the medium, and are included on the list of The 1000 Greatest Films Ever Made on the website, They Shoot Pictures, Don't They. That same website has a list of the top 100 directors, and Dreyer is #16 on that list. Dreyer's films are quite different in look and tone from contemporary film; they lack the flash and sizzle, the eye candy, the easy sentimentality and emotionalism, the popular appeal, the superfluous fluff of much of the popular Hollywood product. They are what might be called "austere," "difficult," or "film school movies" or "movies for crazy movie-lovers" or even "boringly dull." But there is a great emotional and psychological depth to them. Some people have called them "spiritual" or claimed that they have a "transcendental style." There is an aesthetic, intellectual, and emotional purity to them. Dreyer was noted for being extremely controlling and dictatorial on his sets—"tyrannical" is the frequently-used term. He was especially so toward his actors, so much so that, while they were working and undergoing his treatment, they would swear that they would never work for him again. While making "Joan of Arc," for example, he forced Maria Falconetti [his Joan] to cut off her hair. She protested, howled, begged, then ultimately relented, collapsing in tears. Dreyer had her filmed while she was crying. While making Days of Wrath, in order to get 66 year old Anna Svierkjaer—she was burned as a witch in the movie—to have the demeanor that he wanted in his film, Dreyer tied her to a ladder and left her in the hot sun for two and a half hours before filming her. Afterward, Dreyer untied her and was extremely solicitous toward her, but she had trouble standing or sitting up for several hours. After he got what he wanted from them, Dreyer would be the height of comforting and solicitous toward his actors, and many of them commented afterwards that he had succeeded in getting the best acting from them that they had ever done. Also, away from the set, Dreyer was a mild-mannered, unpretentious, and gracious man. He spent up to sixteen hours a say studying, reading, researching, and writing on his scripts. Dreyer's films are also noteworthy for giving sensitive, sympathetic, and compassionate portrayals of women, especially women when they are harmed, impregnated out of wedlock, threatened, victimized, abused or otherwise put upon, by circumstances or by men–husbands, lovers, fathers, brothers, or priests. Women in his films are often the source of warmth and the spiritual centers and anchors of families and other institutions, being maternal, sensual, spiritual, and practical all at once. 1920 The Parson's Widow Prästänkan Sweden/Denmark Based on the story "Prestekonen" by Kristofer Janson. 1921 Leaves from Satan's Book Blade af Satans bog Denmark Loosely based on the The Sorrows of Satan. 1924 Michael Michael Germany Based on the novel Mikaël (1904) by Herman Bang. 1925 Thou Shalt Honor Thy Wife (aka Master of the House) Du skal ære din hustru Denmark Based on the play by Svend Rindom. 1926 Bride of Glomdal Glomdalsbruden Norway/Sweden Based on the novel by Jacob Breda Bull. 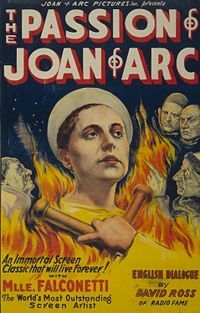 1928 The Passion of Joan of Arc La Passion de Jeanne d'Arc France Co-written with Joseph Delteil, author of the novel Jeanne d'Arc (1925, Prix Femina). 1932 The Vampire Vampyr - Der Traum des Allan Grey France/Germany Based on the novella Carmilla (1872) by J. Sheridan Le Fanu. 1943 Day of Wrath Vredens dag Denmark Based on the play "Anne Pedersdotter" by Hans Wiers-Jenssen, hymns by Paul La Cour. 1945 Two People Två människor Sweden Based on the play "Attentat" by W.O. Somin. Made in Nazi-related exile to Sweden, the film was disowned by Dreyer and withdrawn from distribution. ↑ Sun Times, Roger Ebert. Retrieved December 29, 2008. ↑ They Shoot Pictures, 1000 Greatest Films Ever Made. Retrieved December 29, 2008. Bordwell, David. The Films of Carl Theodor Dreyer. Berkeley CA: University of California Press, 1981. ISBN 9780520039872. Carney, Ray. Speaking the Language of Desire: The Films of Carl Dreyer. Cambridge UK: Cambridge University Press, 1989. ISBN 9780521378079. Drum, Jean and Dale D. My Only Great Passion: The Life and Films of Carl Theodor Dreyer. Lanham, MD: Scarecrow Press, 2000. ISBN 9780810836792. Schrader, Paul. Transcendental Style in Film: Ozu, Bresson, Dreyer. New York: Da Capo Press, 1988. ISBN 9780306803352. Skoller, Donald. Dreyer in Double Reflection: Translation of Carl Th. Dreyer’s writings About the Film (Om Filmen) New York: Da Capo Press, 1991. ISBN 9780306804588. History of "Carl Theodor Dreyer"
This page was last modified on 12 January 2017, at 21:24.